While the rather underwhelming (Coach Rick’s characterization of my reaction to the results) PAGU Individual Event Championships took place in Argentina, with the United States present, everyone else of consequence was over in Europe at the Massilia Cup in France. The Massilia Cup’s Web site is beyond useless, but I’ve finally gotten my hands on some results. Note that there is both the Open and the Cup. The Open is for all teams who are interested in competing, while the Cup is limited to the official delegations from the top eight countries. The top performers then compete in an all-around known as Top Massilia in which each gymnast competes as many events as she chooses. It’s an EF competition, but for some reason they also compile all-around scores. 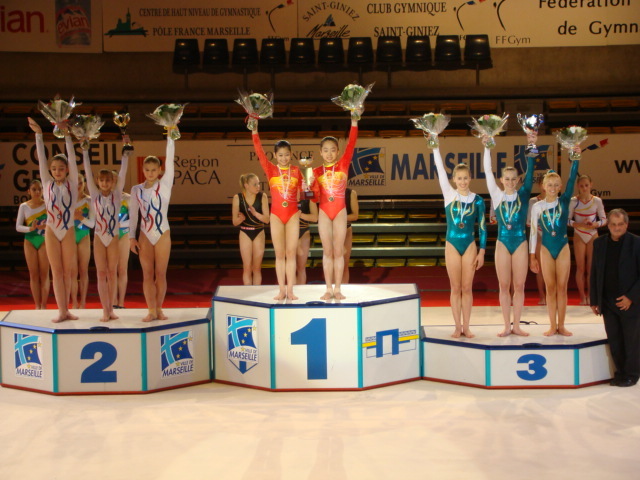 The Chinese dominated, sweeping both all-arounds and both team finals, with Jiang Yuyuan and her teammate Guo Wei winning the Cup (with only two competitors while all of the other teams had three, top two scores count), and Jiang taking gold in the Cup all-around and gold on bars and floor in Top Massilia. To be fair, however, the Chinese had the most experienced team (with Jiang), followed by the Australians, who placed third. The Russians took second, with the graceful Aliya Mustafina replacing Tatiana Nabieva, who was scheduled to compete (no word on what happened), Viktoria Komova (who does a Patterson dismount on beam), and Kristina Goryunova (Goryunova appears to have replaced Anna Demienteva, who was scheduled). Goryunova went on to medal in two EFs in the Top Massilia; Mustafina on one. Russia beat China in team finals on vault, but just barely, and floor by nearly a point, while the Australians actually placed first on beam, but came in only third. The three Russians went 4-5-6 in the all-around, Goryunova, Komova, Mustafina. Mustafina had the highest score on floor of all competitors. Australian Lauren Mitchell had a good meet, taking second in the all-around in the Cup and first in the all-around in Top Massilia with silvers on two events, and third by team with Ashleigh Brennan and up-and-comer Britt Greeley. (Note: advance word had Emily Little competing on the Cup team and Greeley on the Open team. Not sure what happened.) And despite the scandal brewing at home, the Brazilians placed a respectable fourth. Their highest placement in the all-around was Bruna Leal, ninth, with Ethiene Franco tenth and Khiuna Dias twelfth. The disappointments come for the French and the Romanians. The French senior team, with Youna Dufournet making her senior debut, placed only fifth, with a fall by Dufournet on bars and on her triple twist on floor. The other French competitors were Laetitia Dugain and Manon Erre (Dugain appears to be replacing Angeline Serre, who was expected to compete). Dufournet placed only eighth in the all-around with low scores on beam and floor. Marine Brevet and Chloé Stanic, two up-and-coming French juniors, actually beat Dugain, who placed a dismal 21st of 23. But the real trouble is for the Romanians, who came in a dismal sixth despite putting up some of their top new talent — Amelia Racea, Diana Trenca and Claudia Voicu. As I’ve mentioned, the Romanians have a huge problem with vault (Racea does the best one, a FTY), and tend to score in the mid-50’s. Racea posted a reasonable 57.050 with trouble on bars to finish seventh. Voicu placed thirteenth, Trenca eighteenth. Hopefully the move to Deva by many of their top gymnasts of the next generation, including these three, will sort that out. None placed in any EFs. As for the Open, the Canadians overperformed, taking the second and third spots on the team podium and placing Dominique Pegg in third place in the all-around. Pegg was my choice for top Canadian junior. A WOGA team placed fourth, but I don’t know who competed. The two Chinese girls who placed first and second in the Open, Zhang Yujiao and Kang Xiaojun outscored Pegg by 1.5 and 2 points, respectively. Briley Casanova, a fairly well-known American junior, took fourth. Casanova had the highest score on vault and tied with Kang for the highest score on floor, but took a hit on bars with a 12.750. As I mentioned, Mitchell placed first in the Top Massilia. Racea placed second — leaving out bars — while Goryunova placed third and Pegg fourth (the highest finish by an Open competitor). The rest of the competitors did not compete three events and I’m not even sure why they do this ranking. More importantly, the Dutch Wyomi Masela placed first on vault, the best finish of any Dutch competitor. Goryunova took second, just above Dufournet on what some might say is her best event. As I mentioned, Mitchell took silver on three events (bars and beam, her best-scoring events). Jiang, unsurprisingly, dominated her competition on bars and floor. Guo took first on beam and third on floor, cementing the Chinese dominance. Finally, the audience was also treated to a performance by Nastia Liukin who, however, appears to have used one of her routines from the Tour of Gymnastics Superstars. If I remember correctly, I didn’t enjoy it. Full results are available here. That link is weird, so if it doesn’t work, here is the Massilia Cup main page.